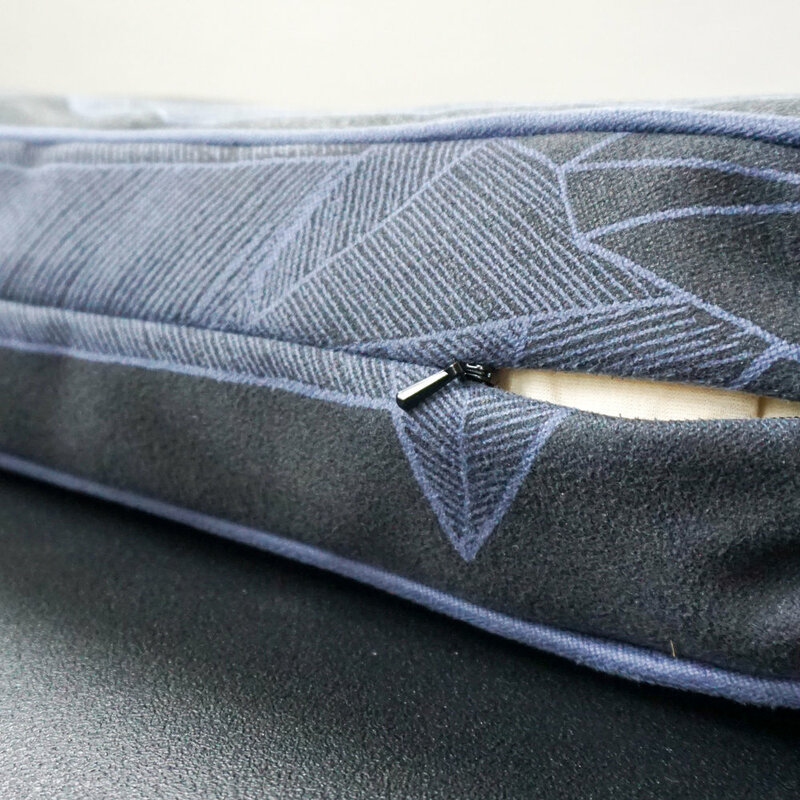 Little things like an invisible zipper keep our Lucky Dog Beds lookin' sleek! Click the photo above to check them out. Sometimes the smallest thing makes all the difference. It’s likely something so common or subtle, that this one small detail decides whether life can proceed accordingly. It can be the one perfectly colored chair that completes a bedroom ensemble, or a simple repair that changes a chair from foe to friend. This repaired broken leg has a scar and a story to tell. Most of the time I’m sewing brand new pillows or completely restoring pieces, rather than trying to work within the technical and spatial limitations all repairs encompass. Attention to detail, a flair for nuances and perfection, makes any repair or subtle adjustment disappear into the background. Blending in so that no one notices is a good thing when it’s a repair done well. A bad repair stands out like a sore thumb, appears thoughtless and rushed, and can prompt a furrowed brow that suggests ‘something just doesn’t look right’. Here’s a few repairs that did go right and both were cheaper than buying a new chair. The seat button was torn, but this gentleman client loves his office chair. He’s had it for decades and found a piece of vinyl fabric to fix his beloved. He’d been saving this chair and the fabric for maaaaaaaany years in hopes of getting it repaired one day. 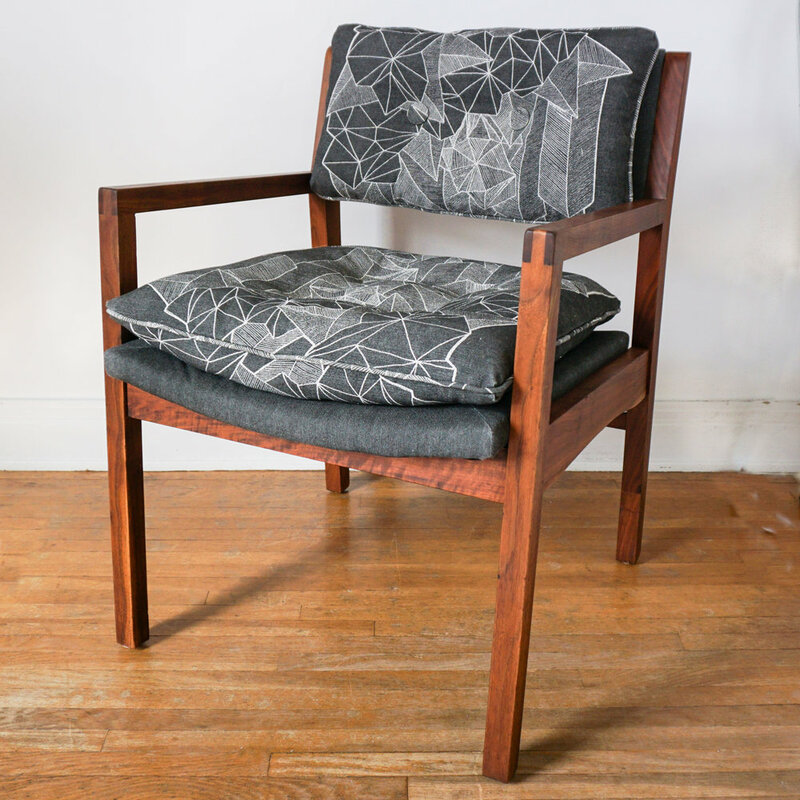 The construction of this chair limits a traditional restoration: dismantling the frame, reupholstering, then reassemble. The upholstery of this chair is attached to a flexible frame, then popped into the rigid plastic frame. Potentially brittle plastic and an overall design never meant to be disassembled really meant I had to figure out a different solution. Luckily, separate faux seat cushions were a common trend in the sixties like the below examples. I was able to attach the new cushion with the buttons and hide the back seam in-between where the seat and back met. Not only is further tearing eliminated, but the client also likes how the new, extra cushioning made up for the now old, flat foam inside his chair. 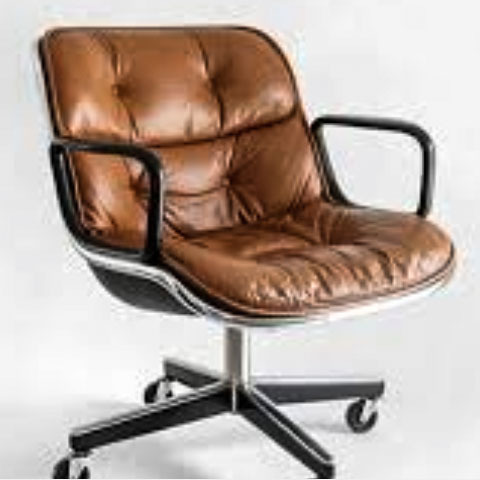 A fashionable chair that could no longer stand after the front legs collapsed. This lovely lady inquired whether repairing the chair was even possible--it's fate similarly reminiscent of a horse with broken legs. Repairing the structure and strengthening the frame is a normal step in traditional restoration, and I figured it was just a matter of gluing and clamping. Upon inspection it was obvious the staples used to construct the frame, had essentially 'slipped' out from the pressure. Remove front frame and clean the break to begin repair process. Staple construction is the cheapest, weakest, and fastest option. Screws and glued wood dowels, as found on all better quality frames, would have made all the difference. In this case, a damaging break on the right side forced the wood frame to slip away on the left side. This repair is all about the patience of working in small steps, gluing each piece one at a time and allowing each layer to dry. 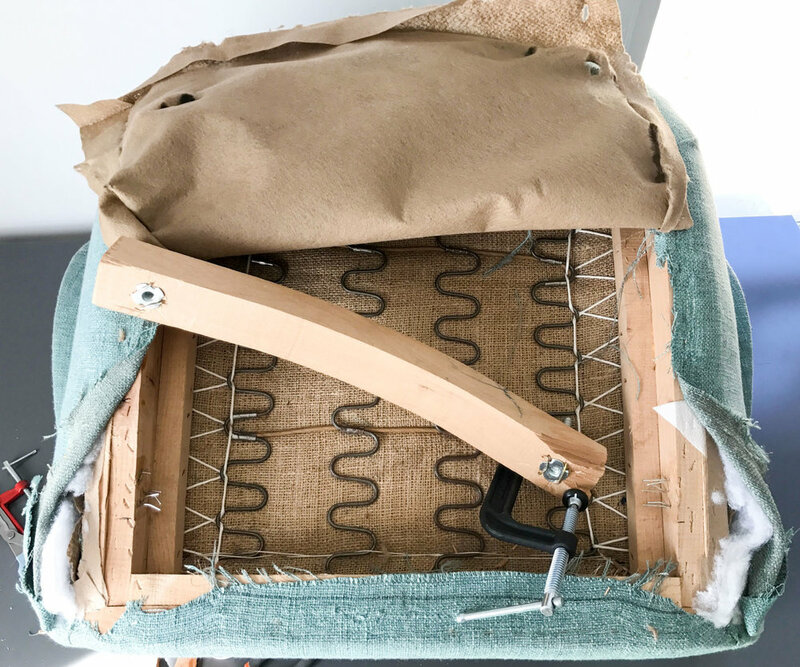 Ultimately, a simple repair that gives this chair another kick in the hay! Glue and clamp first broken wood piece. Glue and clamp last wood piece. Fill large spaces with traditional putty. Press putty under hardware for strength. Layer of sawdust and wood glue. This extra step reduces future splintering. Staple holes from dustcover are filled with sawdust and glue, as like in traditional full restorations. Sh!t ton of glue and long screws (see BLUE lines) secure the frame for a long life of rugged use. One of my clients said it best, "Here is the chair now. It is getting a new life". Not only can her life now resume with her totally cool chair, but she saved money by choosing to repair rather than buying brand new. She also did not contribute to the already ten tons of furniture we throw away every year, and did not use any petroleum or non-renewable resources found in mainstream, big box stores. And me? Yeah, hopefully I have a new client who'll think of me every time she needs upholstery help. More importantly, we both created one more link in the chain of people taking time to take care of our lives and planet.